Joyeux anniversaire à mon papa! "The greatest gift that I possess..."
How is 2010 treating you so far? How many resolutions have you broken? Or kept? 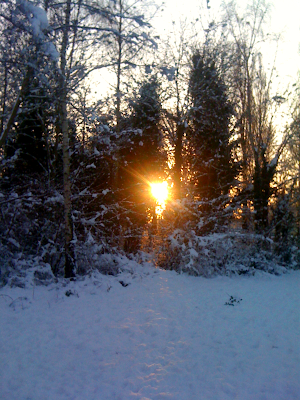 So far 2010 has bewildered me, mainly due to the snow. I've been having a lot of trouble working out what day it is due to having lots of snow days and working from home days in the past week. I've never seen so much snow in my whole life and I've loved every minute but, to be honest, I'm ready for it to melt now. I had lots of evening plans for the last few days and I've had to cancel every single one due to the treacherous nature of the roads. It turns out that snow is not good for your social life. Who knew. More than that though, I think I've been using the snow as an excuse to not exercise and to not eat as healthily as I should have been. 'Ooh it's snowing, pass me the hot chocolate' or 'Ooh, it's snowed, I can't possibly go to the gym now, I'll have to sit in front of the fire with a box of chocolates instead' or even 'Ooh the snow's still here, pass me that bucket of butter and I'll bathe in it for a while'. It didn't help that Slimming World was cancelled last Tuesday as I took it as a sign that I SHOULD EAT LIKE THERE WAS NO TOMORROW. Fool. So today was the last supper. I went to Bluu in Manchester with my friend N and gorged myself on three courses of pure joy. All food is half price for the whole of January so it would have been rude not to, right? Salt and pepper calamari, chicken, bacon and leek pie with mash and peas and half an assiette of desserts are sitting nicely in my belly and I'm now ready to forsake decadent food for the foreseeable future. And get myself to the gym as often as humanly possibly.